Halloween preparations do not just end when costumes and decorations are done. Food is important too. No tricks here, mummies. 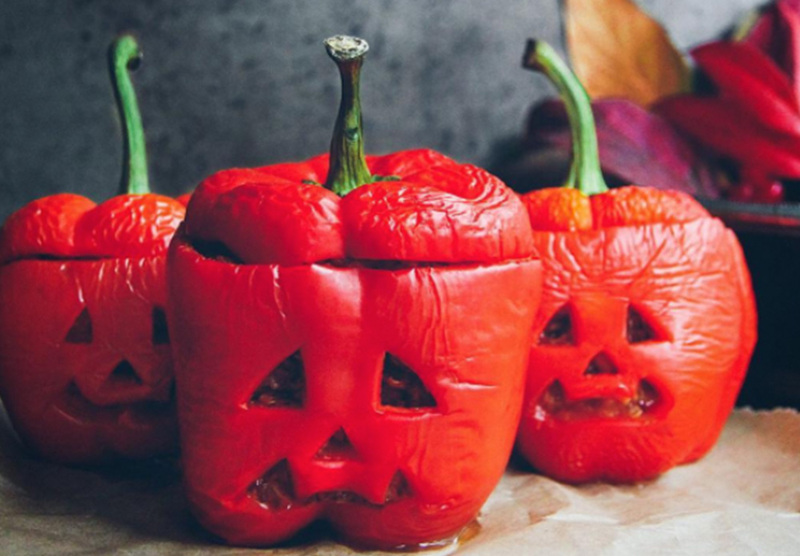 We’ve rounded up some yummilicious sweet and savoury recipes for you to try out this Halloween! 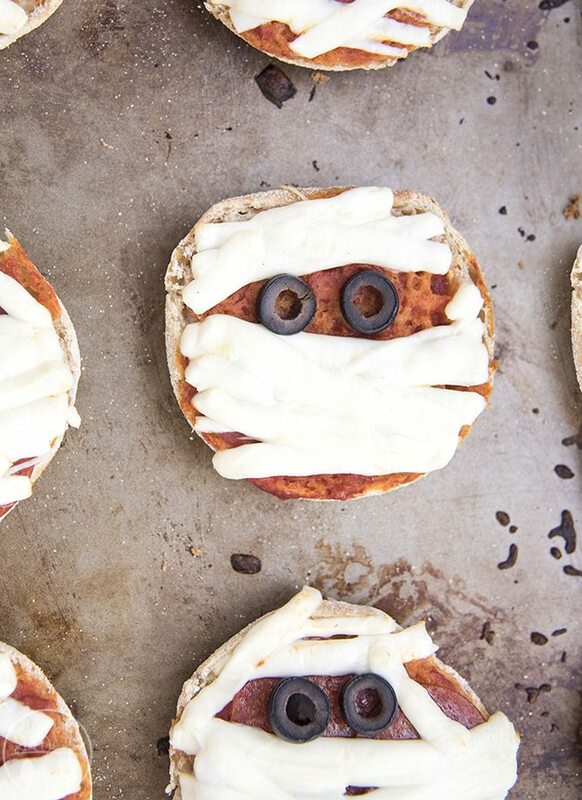 This mummy pizza is so easy you and your kiddos will have a ball making them. Ingredients include English muffins, pizza base or marinara sauce, favourite pizza toppings, grated cheese and olives. Halve the English muffins and use it as a base of the pizza. Next, spread the sauce and sprinkle toppings of your choice. Then separate the cheese and layer it in a criss-cross pattern to create your mummy. Use olives as eyes and you’re done! 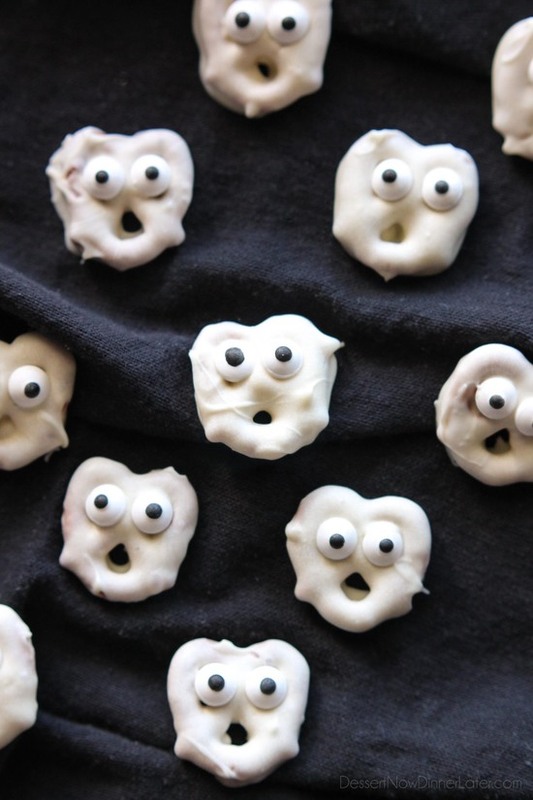 Boo away the kids with these adorable ghost pretzels. 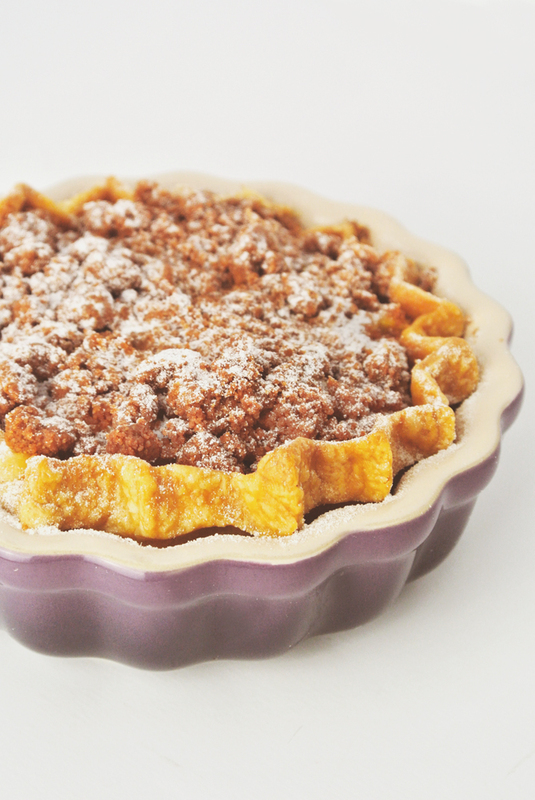 The recipe calls for only three ingredients and you can do this with the kids! You need a bag of pretzels, white chocolate and candy eyeballs. Coat the pretzels with melted white chocolate and place candy eyes on the pretzel. The hardest part of this recipe is waiting for the chocolate to set. Keep things spooky with the main course. 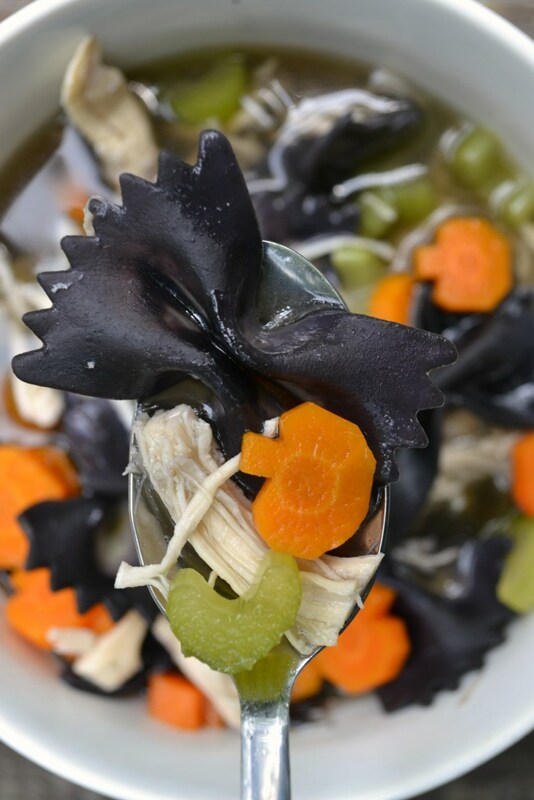 Brew this chicken BOO-dle soup in your cauldron. 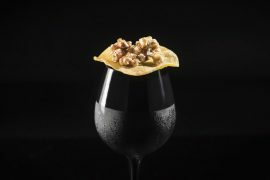 Dye farfalle pasta black with food colouring (or use squid ink pasta). To turn your carrots into pumpkins, cut slits lengthwise down the carrot and make a perpendicular cut from the edge of the carrot until it intersects the first cut you made. When you’re happy with the how your ‘pumpkin’ looks, cut them into one-inch pieces. 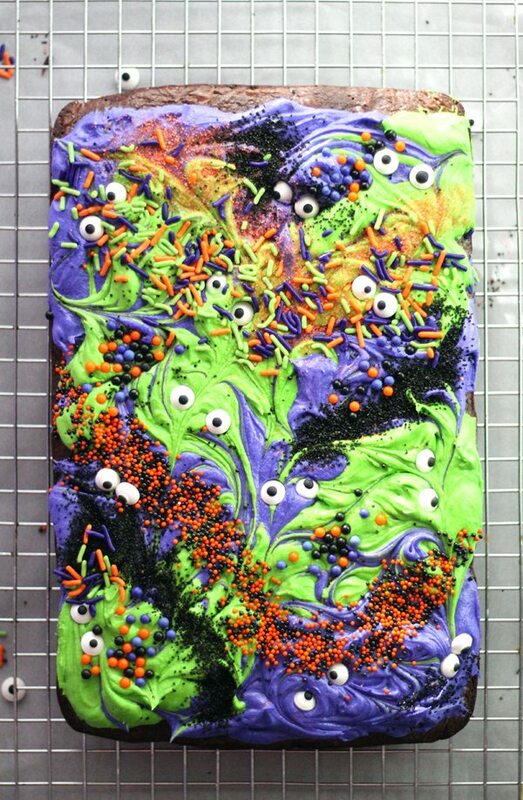 If you love making brownies, these neon monsters will be perfect for Halloween. These brownies are topped with coloured cream cheese frosting and sprinkles. Simply make a brownie (homemade or boxed). Make the cream cheese frosting, divide into separate bowls and colour. Spread and swirl frosting on the brownie once its had a chance to cool off. Finish it off with candy eyes and sprinkles. 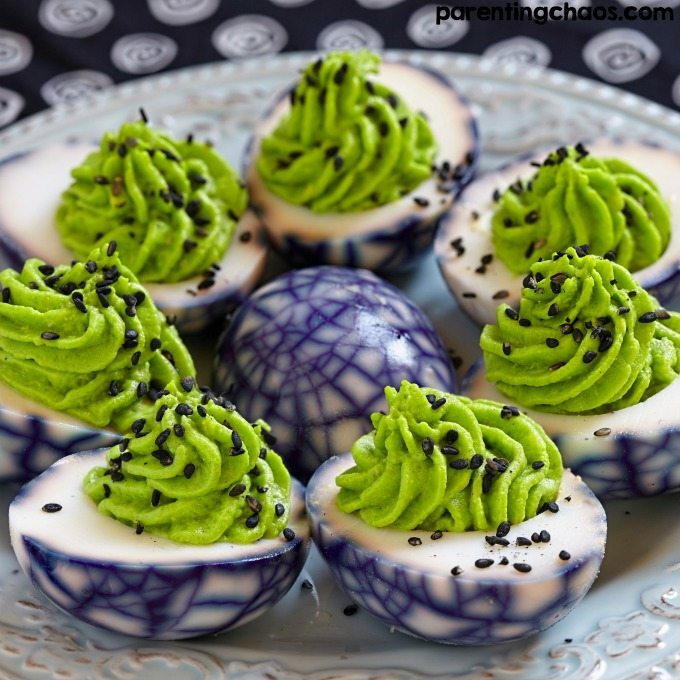 Craving Deviled Eggs? The perfect twist to fitting Halloween. You need eggs, mustard, mayo, Worcestershire sauce, green and black food colouring. Hard boil the eggs, crack the shells (but don’t peel the shell off yet), place cracked eggs in a ziplock bag, drop in a few drops of black food dye and shake until fully coated. This will give the eggs the spider-web effect. Halve the eggs and scoop out the yolk. Combine the yolk well with green colouring, mayonnaise, mustard and Worchestershire sauce. You can use an icing bag or a ziplock bag with a corner snipped off to pipe the yolk paste on the egg whites. Top off with some black sesame seeds (chia seeds work great too). 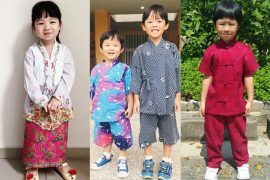 We hope you’ve enjoyed this and more in our Halloween series. 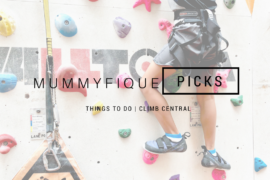 Remember to tag us on Instagram if you’ve tried out any of our tips!